Home » Trump Victory: An Epochal Event? Trump succeeded beyond the odds through an indomitable will. That is something that has not been seen in American politics for generations. Trump was accused of being vague on policy (albeit, Clinton did not evince any more detail of policy than Trump) but what he represented is an idea whose time had come, which asserts itself regardless of party platforms, with a personality that was able to withstand the most vicious domestic smear campaign against a politician in memory. The pundits are right in this if nothing else about Tump: that this was a vote against the Establishment, with much reference among Trump supports in regard to defeating the “elite”. Who this “elite” is has been clearly recognised by Trump, and is easy to identify insofar as it provided the funding for Clinton, as it had for Obama: the financial oligarchy headed up by George Soros. Among Clinton’s coterie of billionaire donors, Soros was by far the largest, giving over $11,000,000. Trump’s largest donor was American rental homes businessmen Bradley Wayne Hughes, who gave less than half a million. (“Hillary is outraising tump 20-to-1 among billionaires”, Bloomberg, Sept. 26, 2016; http://www.bloomberg.com/news/articles/2016-09-26/billionaire-donors-led-by-soros-simons-favor-clinton-over-trump). Trump caused controversy to the point of being smeared as “anti-Semitic,” when he said before a Jewish lobby that he did not need their money. However, worse still, one of the Trump campaign’s last advertisements prior to the election attacked the “global power structure”, supposedly an anti-Semitic code for “Jews”, with depictions of Soros, Lloyd Blankfein, CEO of Goldman Sachs, and Janet Yellen, chair of the Federal Reserve Bank, as representing “special interests” in Washington, “controlling the top levers of power”. One is apparently not supposed to mention such globalists because they are Jewish. Are we seriously supposed to believe that there is NOT a “global power structure,” and that Soros and Blankfein are NOT at the top of this structure? Like “the emperor’s new clothes,” it is supposed to be something that should not be mentioned aloud, and when it is, the knee-jerk reaction is to refer to “conspiracy theories”, as though conspiracies do NOT exist, whether as Mafioso meeting in secret to plan a “criminal conspiracy”, as defined by law; or Bilderberg conferences meeting in secret to arrive at a global consensus (and one can be sure that “what to do about Trump” will be top of the agenda of the next Bilderberg conference). If Soros’ vast network of foundations and NGOs is not in itself a “global power structure” then what is it? Clinton was stated to be a “partner of these people” in the Trump campaign advertisement. Of Blankfein the advertisement stated: “It’s a global power structure that is responsible for the economic decisions that have robbed our working class, stripped our country of its wealth and put that money into the pockets of a handful of large corporations and political entities”. (“Donald Trump’s final ad evokes ‘centuries-old anti-Semitic dog whistles”, Nathan Guttmann, Forward, November 6, 2016; http://forward.com/news/national/353563/donald-trumps-final-ad-evokes-centuries-old-anti-semitic-dog-whistles/). Hence Trump, despite Jewish family connections, and pro-Israel statements, has shown that he is not beholden to money or moral blackmail and intimidation from the Israel lobby. In regard to Russia, Trump’s pro-Russian sentiments have been used against him as though he is a traitor, while, simultaneously being attacked as a war-monger by supporters of Clinton, whose record as Sectary of State was very much that of a war-monger. It is one of the features of the presidential campaign: projecting Clinton’s outlook onto Trump, as “nasty”, “dangerous”, “unstable”, “moneyed”; all characteristic of Clinton in magnified form. Indeed, Trump’s praise for Putin was regarded as outrageous. The possibility of a Russo-American accord in world affairs strikes terror into the hearts of the “global power structure” and the “special interests in Washington”. An immediate, hopeful result could be the reversal of U.S. policy in the Islamic world by seeking “regime change” through the arming of terrorists in the name of “fighting terrorism”, specifically in regard to Syria. Trump was ridiculed for stating that he has a “secret plan” to deal with the Islamic State. Yet considering that Trump’s military adviser has been the former head of the American Defense Intelligence Agency, Lt. Gen. Michael Flynn, a brilliant strategist, that Trump has developed a far-reaching plan with Flynn is plausible, one might say likely. Of arguably more importance however is that Flynn is no Russophobe; to the contrary, he is pro-Russia, and an analyst for Russia Today. (“Donald Trump to bring adviser with Russia ties to classified briefing”, The Huffington Post, Aug. 16, 2016; http://www.huffingtonpost.com/entry/michael-flynn-trump-classified-briefing_us_57b3939fe4b0edfa80da28ca). Another Trump foreign policy adviser has been Carter Page, who in 2015 wrote in the Global Policy Journal condemning Obama’s sanctions against Russia over the Ukraine. Page also criticised U.S. officials such as Assistant Secretary of State Victoria Nuland for fomenting the Ukrainian riots. (Huffington Post, June 21, 2016; http://www.huffingtonpost.com/entry/trump-carter-page-russia-sanctions-black-lives_us_5769bf64e4b065534f482504). Michael Pence, vice president elect, has evoked anti-Russian sentiments, unknown to Trump who, when questioned on them, promptly repudiated Pence’s view. Hopefully Pence will be kept in line. More problematic, although no more belligerent than Clinton, has been Trump’s rhetoric condemning Iran as sponsor of “Islamic terrorism”. It does not fit well with Trump’s positive positions in other areas of foreign policy. The Trump revolt is also a major blow to globalisation. Trump stood as the anti-free trade candidate against Clinton, pushing her into opportunistically and cynically reversing her attitude towards the Trans-Pacific Partnership Agreement. He has spoken of applying tariffs, of re-industrialising the USA, and rebuilding the infrastructure of roads and bridges, in what will have to be a colossal undertaking of state planning. The infamous “Wall” that became an inordinate focus of the campaign both for and against Trump, is one part of a process that is required to free the USA from the “global power structure”, since the free movement of labour (people), is as much part of globalisation as the free movement of capital, resources and technology. There are more complex factors at work than “racism”; a red-herring. (See Bolton, Babel Inc., London: Black House Publishing, 2013). Trump has criticised the Federal Reserve; can and will he act to retrain its power? This also has made the “global power structure” nervous: “As Wall Street grapples with the election of Donald Trump as the next president of the US, it appears the order of the day is uncertainty. Among the myriad of uncertain consequences of Trump’s election is the real possibility of a major shake up at the Federal Reserve”. (Bob Bryan, “Donald Trump’s election has Wall Street questioning the future of the Federal Reserve”, Business Insider Australia, Nov. 10, 2016; http://www.businessinsider.com.au/donald-trump-presidential-election-federal-reserve-janet-yellen-2016-11?r=US&IR=T). Here we have what might seem a paradox about the whole election, but is really historically consistent: the Left and the oligarchy both backed Clinton. Her policy was that mixture of social liberalism and free trade that sees a convergence of the Left with international finance (See Bolton, Revolution from Above, Arktos Media Ltd., 2011), remarked on by Oswald Spengler nearly a century ago when he said that Leftists movements operate in the interests and direction of “money”. (Spengler, The Decline of The West, London: Allen and Unwin, 1971, Vol. II, 402). 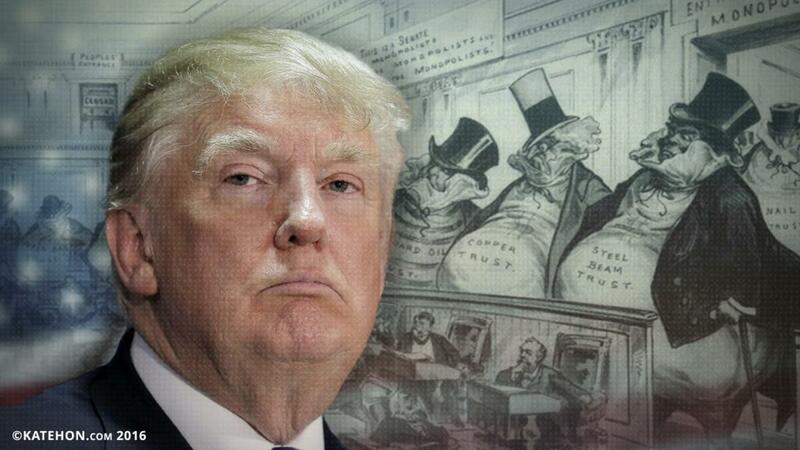 A dichotomy will be established in the USA if Trump proceeds with the anti-Establishment revolt once in Office: The USA under Trump’s presidency could become a bulwark of anti-globalisation while simultaneously remaining the world headquarters of the globalist “power structure”. Wall Street will continue to exist and so will Hollywood. However, under Trump will the U.S. State Department continue to sponsor multiculturalism throughout the world, including Hip Hop concerts in Europe, as a means of breaking down traditional cultures, in tandem with the programmes of the Soros network, Freedom House and many others, listed as undesirable NGOs by Russia? (See Bolton, Babel Inc., op. cit.). One hopes not. Will U. S. Congress continue to provide funds for the privately run National Endowment for Democracy to continue sponsoring subversive organisations to create “colour revolutions”, and interfere in the domestic politics of sundry nations; Russia in particular? Trump has questioned the USA’s mission to “police the world”, and the wisdom of having overthrown Gaddafi and Saddam, charging the global power structure, fronted by Clinton and Obama, with having “created Isis”. The question occurs as to whether the Trump Administration can or will reign in the mostly U.S.-based NGOs that have created what globalist strategist Ralph Peters has lauded as “constant conflict”. The Leftist convergence with the “global power structure” is already being played out on the streets of the USA, a day after the Trump victory. The Clintonistas are rioting and demonstrating. These Leftists follow their historic role as the useful idiots of a capitalist dialectic; supposed anti-globalists, pacifists, effete males, butch-lesbians, agitated Afros and Latinos, Bernie Sanders Social Democrats, venting anger against the only revolt driven by rural America and the “rust belt” whose candidate opposes globalisation, free trade agreements, U.S. global meddling, and the escalation of war scenarios. (“Thousands of anti-Trump protestors take to streets of U.S. cities”, Reuters, Nov. 10, 2016; http://www.reuters.com/article/us-usa-election-protests-idUSKBN1343CO). One can expect Soros money to flow into a movement for “regime change” within the USA in the way Soros money flows into the “Black Lives Matter” movement. (Bolton, “Megabucks for BLM: another Left-wing cause with capitalist sponsors”, Right On, Aug. 6, 2016; https://www.righton.net/2016/08/06/megabucks-for-blm-another-left-wing-cause-with-capitalist-sponsors/). Plutocracy-orchestrated riots against Trump could be the catalyst for the revival of the type of New Left anarchy that was promoted by oligarchs during the 1960s and 70s. (Bolton, Revolution from Above, op. cit., “New Left from Old”, 144-200).